NABLUS (Ma’an) — Israeli settlers reportedly attacked Palestinians who were harvesting olvies in the northern occupied West Bank district of Nablus on Thursday, injuring three Palestinians, including one woman. Ghassan Daghlas, an official who monitors settlement activity in the northern West Bank told Ma’an that Israeli settlers from the illegal Itamar settlement assaulted Palestinians picking olives in the Ras Hazem area in Deir al-Hatab village. Daghlas added that Israeli settlers threw rocks and sharp objects and physically assaulted the Palestinians as they were working on their land. 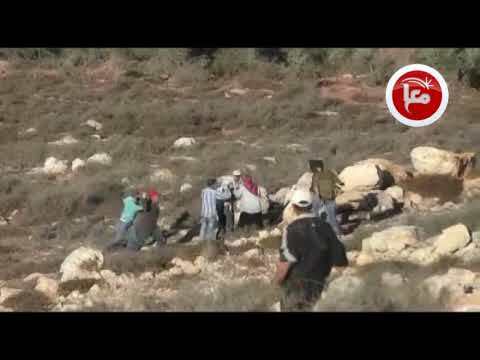 Video of the attack shows the settlers attacking the Palestinians, as an Israeli soldier stand nearby. The injured Palestinians were identified as Jibril Abd al-Latif Zamel, Riyad Zamel and Ruwaida Zamel. He pointed out that the Palestinians had to coordinate with Israeli and Palestinian officials in order to access their land to harvest olives.